4.1 x 3.4 x 2.9 cm. 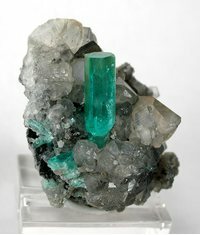 A vug of well crystallized, gray calcite hosts this incredibly gem-clear, transparent, rich green emerald, measuring 1.75 cm in height. 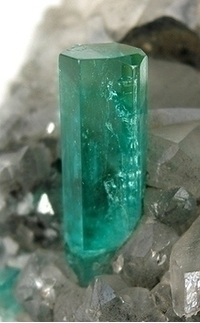 In recent years, the Coscuez Mine has produced many fine emerald specimens, like this one. However, to get such an aesthetic piece, without damage (and not a fake) is nearly impossible. This was an older specimen, obtained from a friend's collection. Ex. Alain Martaud Collection.